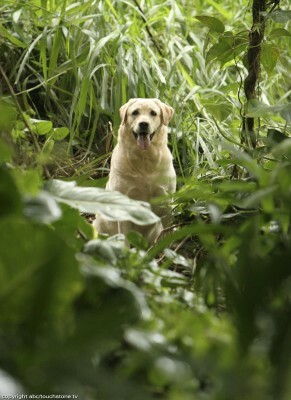 A happy, friendly yellow Labrador Retriever, romping playfully in and out of the bushes. He wears a makeshift doggy collar fashioned out of thin strands of twisted jungle vines. Hidden within the tangles of his collar is a little piece of paper with the words "OCEANIC FLIGHT 815" scrawled across it.